Eyeteeth: Incisive ideas: How the world sees us: "D'oh, pardner!" How the world sees us: "D'oh, pardner!" 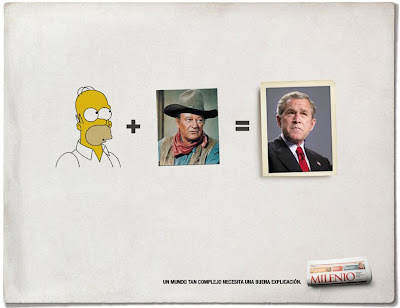 Steve at MinMon posts this ad from the Mexican newspaper Milenio. Translation: "A world so complex needs a good explanation." That's quite possibly the funniest thing I've ever seen in my life. It just transcends the language barrier to completely degrade the President. Well done, Mexico. And that I say is what you call "Freedom of Speech" and "Democracy".